Battle balance followed by the transition to 2D. I’ve toyed around with the idea of how many lyrical songs I want and whether I want them vocalized or not. 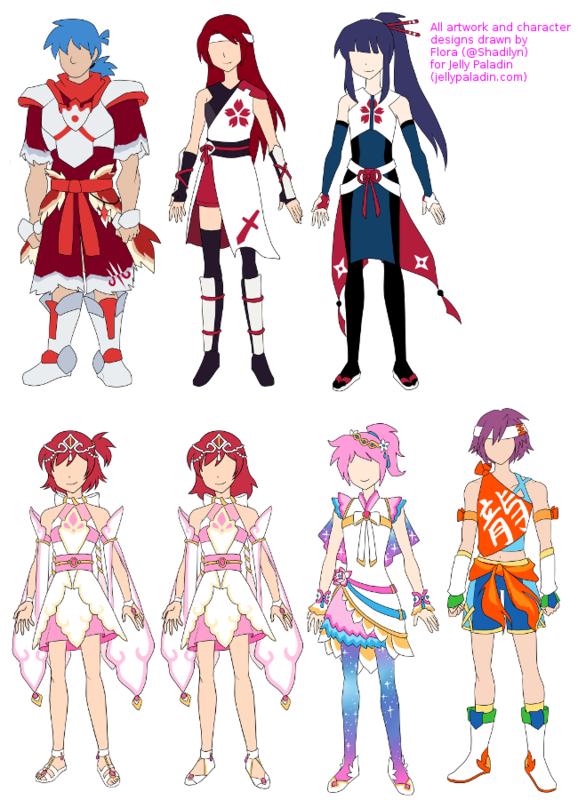 Besides the one above, Cotelle, Minori, and Star have three songs conceptualized between them. I’m not a songwriter by trade, though, so I don’t want to fall into a “lyric creep” trap. It might only be two songs in the end. A) I’d have a five-minute anime intro video if you wait on the New Game screen. B) I’d have a Musical Mode. Turn it on and all major scenes are fully vocalized songs. Since I accomplished most of what I intended this past week, I’m approaching a major crossroads. Any indie designer or developer naturally considers how much of the game should be finished before they release a beta into the wild for play testing. I’d always intended to complete one continent, which meant four dungeons, but now that I have two dungeons mostly done at least in terms of enemy stats, moves, and behavior, I’m questioning whether an earlier start would benefit me. If so, then I need to begin looking for a pixel artist and possibly a composer pretty soon. The time is nigh to start roaming the land of Miharu! In 2D! This entry was posted in All Text, Devlogs, Dreamblazers, Video Game Music on July 28, 2014 by JellyPaladin. I still have a bit left to do here this week! Green indicates an upside of an attack, such as how much it costs to use relative to how much damage it deals or extra status effects it inflicts; yellow indicates a downside, such as how much it costs to use period or how inaccurate it is. Not shown, though, is another hidden element of balance: distribution. Flame Spray is all around superior to Fire Wall, but the latter can be used by almost any mage with a fire affinity while Flame Spray is reserved for wyverns, dragons, and other rare fire breathers. This type of setup means that move creation is very front-loaded. Since I didn’t have any archers until this point, suddenly five new moves appeared for the Elven Archer enemy—five moves that I won’t need to create again for any of the Ranger enemies! Likewise, the Dryad and Sylph Mage had twelve new moves created between them, but other magic-using enemies will share their attacks. Again, Pokémon is a useful analogy. If I created moves in Pokédex order, then I’d get through 18 Pokémon with only one Electric-type move before suddenly several show up at the Rattata mark (#019) and even more for Pikachu (#025). However, by the time I hit Gengar or so (#094), I’m guessing that over 85% of moves would be created for only 13% of Pokémon. Not that I’m operating on such an enormous scale, of course, but the ratios are a great point of comparison. All of this does entail lots of spreadsheet legwork to creating attacks before I can even touch Unity or ORK. I don’t mind, but progress feels more tangible in a playable demo than in rows and columns, even if it’s a playable demo loaded up on placeholder everythings. This entry was posted in Devlogs, Dreamblazers, Game Design, Indie Development and tagged Pokémon on July 21, 2014 by JellyPaladin. One downside of weekly updates is that it might make me look erratic at times. We’ve extended art deadlines for reasons that it wouldn’t be right for me to disclose, so character designs will return to the backseat for a little while and I can get back to balancing the stats of friends and foes! Taking a break from battles has cleared my head a bit, which was very needed. Right now I’m adapting a similar HP scale to Pokémon and Dragon Quest, but the balance has felt off to me compared to either game. I was just getting stuck on that point when the big news hit, but a little distance has given me some perspective and ideas, so it’s time to run through all of them. This entry was posted in All Text, Devlogs, Dreamblazers, Indie Development and tagged Dragon Quest, Pokémon on July 14, 2014 by JellyPaladin. 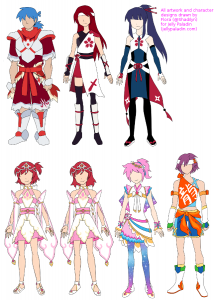 From left to right, top to bottom: Kelly, Faray, Lash, two variations of Leaf’s princess outfit, Jig’s magical girl outfit, and Telia. Just try to match up the character classes: Artisan, Berserker, Hero, Paladin, Warrior, and Warrior Mage. Whoops! It’s a few hours past Monday here and I forgot about my weekly devlog. With the one precious transition month we have, my days and nights have blurred together into intense 12-14-hour sessions, so I lost track of time. As seen above, though, it did pay off! We’re moving along like nobody’s business with six new finished designs. We had a total of thirteen before this past week, so that’s almost a 50% increase—and Eris’ first round was so solid that she’s almost completely done as well. Not only that, but we accidentally stumbled onto a near-finished Misty design during Winter’s process. Even if Flora doesn’t have time to go through with her (Misty), I’m still further ahead with her than I would have been otherwise. Needless to say, I’m incredibly grateful for this bursting, hectic period of character design. My sleep may be troubled, but my soul is satisfied. The remaining goals of this month are finishing Tango, Winter, Jig, Minori, Eris, Mina, and Star, then drawing the title screen image if we can fit it in. Because she’s my first artist, I’m giving Flora dibs on the first picture that every player will see. Even though we technically finished six designs in the last week, all of them were deep into the creation process; out of these other seven, only Tango and Eris are well along. Still, I believe we can do it. Ideally I’d like to cram in one other character, but that’s just my idle hope—it might be unrealistic and I won’t be selfish with Flora’s time. Only 23 more days of art await. This entry was posted in Devlogs, Dreamblazers, Indie Development, Video Game Art and tagged Game Heroines on July 8, 2014 by JellyPaladin.